The tech retail giant is finding new ways to compete in the brave world of online shopping. Next up: Those all-important holiday results. Shares of Best Buy (NYSE:BBY) rose 40.1% in 2016, according to data from S&P Global Market Intelligence. 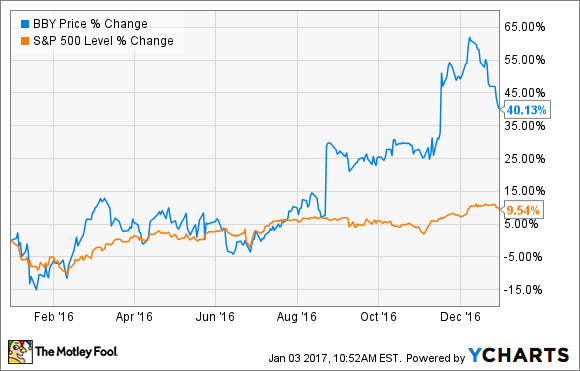 The technology retailer's strong 2016 returns rested on two fantastic earnings reports. Best Buy shares rose 14.5% in August and another 17% in November, propelled by earnings surprises in the second and third quarters. In both cases, the retailer exceeded Wall Street's expectations on both the top and bottom lines. Earnings guidance figures were also optimistic throughout the year, giving investors confidence that the good times should keep on rolling for the foreseeable future. Preparing for the all-important holiday season, Best Buy's management looked ready to deliver the goods. Under the tag line, "Holiday Gifting Made Easy," the company offered free shipping on everything in the online store. For the brick-and-mortar locations, Best Buy brought in additional help in key product categories such as drones, virtual reality platforms, and 4K television setups. Giving in-store customers more help in these unfamiliar shopping categories was meant to help them reach a pucharse decision. The fourth-quarter report in mid-February will tell us whether Best Buy's holiday efforts paid off. Meanwhile, share prices reached new nine-year highs in December.